On a Sunday afternoon near Midway, Kentucky, the odometer on my Toyota Camry rolled to 300,000. The event provided the opportunity to think back on all the places that car has taken me. Deb and I bought it new in March 2005, and it has proven to be reliable transportation for right at 13 years. I did the arithmetic. I’ve averaged 23,000 miles a year in that car. We’ve seen a lot of highway together, a host of different destinations, journeys, and reasons to travel. When we bought the car, I was just beginning to serve in regional ministry. I was in Georgia then, and the work took me to churches across the state. 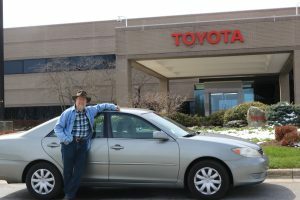 That Camry has carried me to congregations in Georgia, Indiana, Oklahoma, Colorado, and Wyoming. With those congregations I shared joy, heartbreak, frustration, and celebration. In many of those congregations, I sang. The Camry and I have been near sea level and above the timber line. Together we’ve traveled freeways, highways, and even a few forest service roads. Sometimes I didn’t have a destination in mind, I just drove. In this car, I’ve travelled to Mountain View and Winfield. She’s taken me to Drakesboro, Metamora, two Nashvilles, and more gigs than I could begin to count. She has rested in garages in Georgia, Indiana, Oklahoma, Colorado, and back home to Kentucky. This Camry has accompanied me on all of these adventures, has never let me down, and shows no signs of giving up anytime soon. It has been and continues to be quite the journey.